Gliding hotel is situated on the outskirts of the city, far from the city noise among the fabulous greenery. The attractive location with lots of green, regional lakes surrounding the hotel is an ideal place for rest. 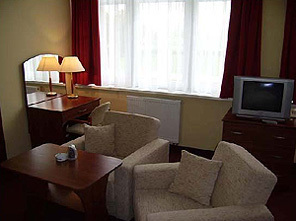 In 2010 the first floor of the hotel has been completely renovated and the hotel has new rooms. 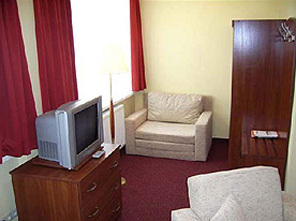 All rooms are equipped with a bathroom, WC, radio, satellite TV, telephone and Internet access. The restaurant for 60 Persons serves dishes of Polish and European cuisine. The hotel offers 2 conference rooms for 48 and 150 seats. The hotel also organizes weddings, parties, trainings, business and family events. There is a possibility to organize the outdoor events including those on individual bases. The moments of relaxation spent in the fresh air will certainly make one feel brand new after hard day's work. After a busy day working or sightseeing guests will relax in a modern sauna. 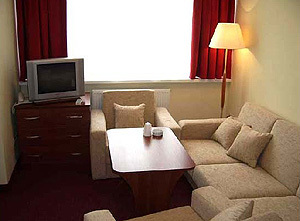 The Hotel is located 3 km from the city center, 2 km from the train station and the bus station. The airport is 75 km from the hotel. 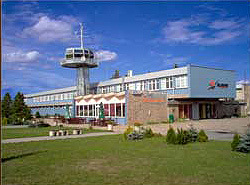 The hotel located close to the sport airport where small planes can land. You can reach the hotel by bus 2 and 3. From the train station drive through the bridge, then turn right, and drive straight on about 2 km. The hotel is near the Preem gas station.